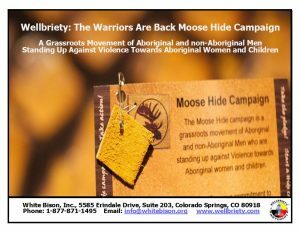 The Moose Hide Campaign is a grassroots movement of Aboriginal and non-Aboriginal Men who are standing up against violence towards women and children. 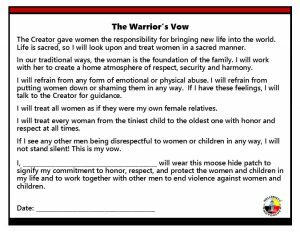 Wearing this moose hide patch signifies your commitment to honor, respect, and protect the women and children in your life and to work together with other men to end violence against women and children. Our vision is to spread the Moose Hide Campaign to organizations, communities, and governments throughout the United States. I made contact with the organization who founded the campaign and asked if the Wellbriety movement would be able to be associated with this wonderful campaign and would we be allowed to implement this campaign among our men here in the US. The answer was Yes, so our version is called: Wellbriety: The Warriors Are Back. Groups or Organizations can get patches by contacting White Bison at info@whitebison.org and give us your name, address and phone number and we will send you a starter kit of 25 Moose Hide Patches. This program could also be implemented by women’s groups, teenager programs, churches, recovery communities….asking the men to come and participate. We also have a Facebook Page to join and get updated information. The Facebook Page is called: Wellbriety: The Warriors are Back. Make the vow to take the stand against violence towards Aboriginal women and children. (The vow is on the card). When appropriate, ask a Respected woman in the community (an Elder, Community leader to be present to make opening remarks before the men take the vow. Perhaps even to make it a ceremony. Wear the patch when ever/where ever appropriate. Do not be silent! Silence can mean approval so be vocal where you stand on violence. Ask the younger men, including teenagers, to wear the patch also. Ask the Grandmas to support this effort. To Show up and pin the moose hide patch on the man after he has taken the vow. Have the councils and other leaders make an announcement of support for the Moose Hide Campaign. Ask all the men in recovery to wear the patch to your recovery meetings. Ask the family programs in your communities to support also. Ask the men to make the vow to protect the women and children. Organize “Warriors are Back” meetings to plan support and encourage other men to join the movement and give a message to anyone doing the violence to STOP! To find out more please go to www.wellbriety.com.